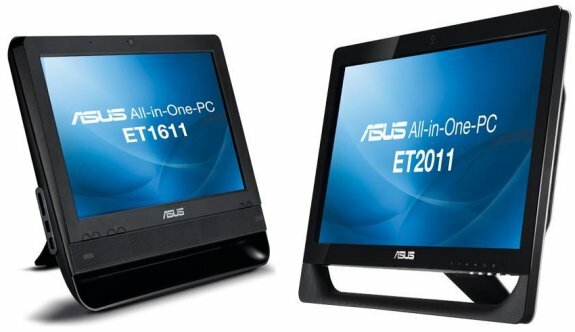 ASUS rolled out three new Eee Top All-in-One PCs; the 15.6" Intel Pine Trail-based ET1611PUT and the 20" AMD Brazos-based ET2011AUKB and ET2011AUTB. Full details at TC Mag. Available with or without an operating system, the ET1611PUT features an 1366 x 768 single-touch and anti-glare screen, a 1.8 GHz Atom D425 processor, GMA 3150 integrated graphics, 2GB of RAM, a 250GB (5400 RPM) hard drive, 2-in-1 card reader, a 0.3 megapixel webcam, Gigabit Ethernet, 802.11 b/g/n WiFi, dual 2W speakers, and five USB 2.0 ports. The OS-free ET1611PUT has a recommended price tag of €369, while the model pre-loaded with Windows 7 Home Premium 64bit costs €449. Both versions are available in black and white.